1- The Amortization Tool, where you can estimate a pay-off by using the Rule of 78 method.or simple interest It calculates the pay off including the expected number of payments made. It also prints a report of payments showing what should be principal and interest as well as the Pay off in each payment period. 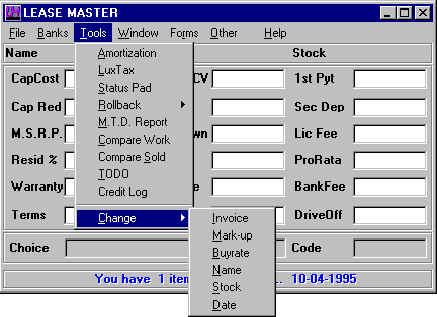 4- The Rollback where you may "roll" the calculations to match a desired payment and you can choose the item that will be changed. This report may be viewed on the screen, printed or faxed directly to your C.P.A. You may copy and paste to other applications and spreadsheets. The unique feature of this Month To Date Report System is that there is no Database to maintain or update when a customer moves or a change is needed. 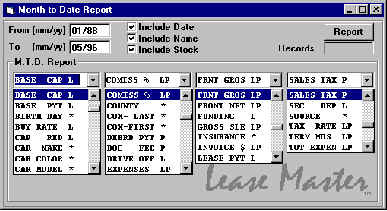 The Lease Master stores all your sold transactions in a separate Directory in your computer (:\LEASE\LESD.WRK) The Month To Date File only contains a list with the last name, stock number, and date of the transaction. When you request a report, the program checks the list and recalls each transaction to retrieve the information needed. So if your customer moves you only need to update the transaction in the sold files and your reports will be correct. For numerical items that report on Leases only. For numerical items that report on Purchases only. For numerical items that report on both Leases and Purchases. For non-numerical items such as descriptions and names. The Check boxes will add their respective items in front of the four selections, When you see a selection surrounded by brackets it means it covers more than one item per line and the program will disable the unavailable drop down boxes.